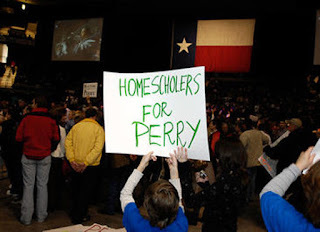 Texas Governor Rick Perry is a bit of a loon. 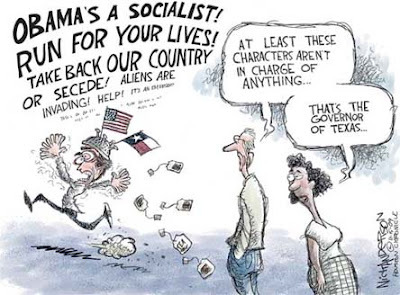 Last year, he openly advocated Texas seceding from the United States, and claimed that it was perfectly legal. This year, he refused to condemn right wing terrorist Joesph Stack who flew a plane into an IRS Federal Building in Austin, Texas, and claimed he "understood" his rage. Obviously, he is on the farthest edge of the right wing fringe. Over the weekend, Perry (who is running for re-election) was asked whether or not he thinks George W. Bush (overwhelmingly viewed by the American people and historians as one of the worst US Presidents ever) was a "great" president. Here was his response: "At the end of the day, when the history books are written, I think George W. Bush will go down as a very, very good President. Approaching great?...Anyone who is not a rank political hack, who has an agenda, and looks at this President’s efforts — I mean, there are two things that I think people judge Presidents on: their safety and the economy." In terms of keeping America safe, the deadliest terrorist attack on U.S. soil — about which Bush was forewarned — occurred on his watch. His disastrous decision to invade Iraq — which “everyone” in Congress now agrees was a huge “mistake” — has resulted in almost 4,400 U.S. casualties. As for his stewardship of the economy, Bush inherited a budget surplus of $127 billion and bequeathed a deficit of over $1 trillion to Obama. During his two terms, median income fell, poverty rose, and two recessions occurred — one of which was a global financial meltdown. If Perry thinks this was “very, very good,” one wonders what classifies as very, very bad. Seriously, how could anyone not either lobotomized or a family member of Mr. Perry consider voting for this guy? I think Steve Perry from Journey would be a better choice! I say Gov Perry should condemn Stack when Obama condemns Fort Hood. Hmmmm makes me wonder if Obama would have condemned 9/11 had he been president. Oh wait no George Bush planned 9/11. We have proof that fire never melted steel before!!!!!! Maybe someone ought tell that to a blacksmith. Lisa, you are insane. WTF are you talking about? The president strongly condemned the attacks at Ft. Hood. But, clearly you are a low information Glenn Beck viewer, and therefore have little to no connection to reality. As for the rest of your blathering, well, I don't know what blacksmiths have to do with Rick Perry and his borderline sedition. Maybe you should take your tin foil hat in for an adjustment. He did? Where on Twitter? Obama immediately down-played that Ft. Hood was a terrorist act perpetrated by a Muslim. The compliant state-run media helped him in his endeavor to not necessarily "offend" any of the practitioners of the religion of peace. Offense is reserved only for Christians, in this no-longer Christian nation according to him. Couple of points, TP. America is not now, nor has ever been a Christian nation. Americans are free to practice any religion they choose, or none at all. Not sure why you'd want to mix religion and government - it never works. The kind of countries that mix the state with religion (Iran, Saudi Arabia) are NOT ones we should emulate. And what exactly was the president supposed to do? A lone gunman starts shooting soldiers at a base in Texas. Was he supposed to declare war on Texas? Or maybe he should pick a country on the map that had nothing at all to do with the attack, say they were involved, and then start a war. Oh wait, we tried that with Iraq. Are you both actually arguing that the president supported the shooter? Is this was passes for reporting on Fox News these days? And Lisa, only dipshits like Sarah Palin conduct "official" business via Twitter. That's her job now, right? She has a Facebook page and uses twitter. And you want her to be president? Oh wait Dave I was wrong I meant to say You Tube. Who said I want her to be president? She isn't the president but it is amazing how much play her Face Book and Statements do get and she is just a half term governor. Best thing she ever did was to step down to spare her state from the expense of those baseless lawsuits perpetrated by those who are threatened by her. Saving money for her state sounds pretty responsible to me. Maybe VP because with each passing painful day,hour and minute anything would be better than the Dynamic Duo we have there now. Yes the Army acted "Stupidly" in the Fort Hood. Did you know Stack was a democrat. Seriously, Lisa. You need some help. First and foremost...turn off Fox News!! You are clearly a victim of right wing propaganda which explains why you are so completely misinformed. The president never said the army acted stupidly at Fort Hood. If you actually saw or read that somewhere, it was made up. My word, are you ever confused. And lastly, Stack was a long time member of right-wing, anti-tax militias and "patriot" groups. He was a right winger. Doesn't mean he was a Republican, but he was definitely of the far right. Just like Timothy McVeigh. Or did Glenn Beck and Rush tell you he was a Democrat, too? Seriously, bring more to the table than the same, tired Beck rantings and falsehoods. This isn't some Red State message board where all you need are a few anti-Obama slams and that passes for discourse. come on Dave there was action here . If you were stranded on a desert island isn't it better to have a friend named Wilson than no friends at all? Admittedly, wingnuts often confuse me with their made up facts and statistics, but this last answer of yours makes no sense. Who is Wilson? And how does that relate at all to Rick Perry? Dave, we have had this discussion multiple times sir. This country WAS INDEED FOUNDED AS A CHRISTIAN NATION! I have provided you with myriads of quotes from our founders that inarguably establish this fact. You choose to ignore that, which is fine, but it does not change the facts. This does not mean that you cannot worship or not as you please. It simply means that these were the core principals of our founding. Read the Declaration of Independence, Dave, and see the various times that God is referenced there. The point of the freedom of religion clause was to prevent the establishment of a state church like the Anglican Church was for England. You have provided quotes, but I rely on the Constitution. No mention of Christianity there. That is what counts. The Declaration of Independence is rhetoric and not law. The mere mention of god does not automatically imply Christianity, especially when you consider how many of the Founding Fathers considered themselves either deists or agnostic. Besides, Thomas Jefferson wrote most of it and he was rumored to be an atheist. And, as for Stack, I'd like some proof that he was a Dem. Do you have a copy of his voter registration card for me to see? How about an FEC report showing he gave money to Democrats. Don't have it? Because there is none. There have been volumes of proof put forward (including testimony from his family)that he was involved with right-wing anti-tax fringe groups and militias. Those groups are not exactly friendly to Democrats and liberals. Note I never said he was a Republican, just that he was on the right-wing fringe. I don't claim to know how he voted in the last election. I think you and Lisa are relying on the "reporting" of Rush "Oxy" Limbaugh. In Stack's screed/suicide note, he went on and on ranting about the same nonsense that your average Timothy McVeigh type would write. Then, at the end of the note, he quoted Karl Marx. So, I guess that is what is passing for "proof" according to Limbaugh. There's 5000 words of right wing, and one sentence of commie, so obviously he's a Democrat. Nice try. FAIL. Dave put down the Huffpo and walk away slowly. That last comment was from Castaway with Tom Hanks. He made a face on a "Wilson" soccer ball and it became his friend the island he was stranded on alone. So what I meant was isn't it better to have m comments than no comments? yes? The "act stupidly" comment was what Obama said about the Cambridge Police situation when he made sure to make a big deal out of that. I guess Olberman didn't show you that because it was one of many "stupid" comments and they are paid to serve and protect. In other words "they" report and "they" decide. Yes, the "act stupidly" comment was from Cambridge. So, why then did you lie and say the president said it about the military at Ft. Hood? You made that up out of nothing. I'm not surprised based on the stuff you say, but it is still a little jarring to see a right-wing myth being invented right before my eyes. I was saying it as a pun. I was using his non reaction to a serious situation(Fort Hood)and comparing to his overreaction to a non issue that he shouldn't had even been involved in and commented on being it was a local problem not one that called for the president to have a speech about. It made him look...."stupid" and IMO amateurish. Is it me or do liberal really have no sense of humor? I mean a little "Ha,Ha" in your response would have been appropriate. Dave... last try. Jefferson, by the proof of myriads of his own quotes, was certainly not an atheist. Any attempt to characterize him as such is just another foolish revisionist history scheme of the militant left's. Further, I find your lack of appreciation for the very document that established our nation as one obtaining its rights for man as having come from God to be nothing more than "rhetoric" in your eyes to be very disquieting. When the founders spoke of God in that "rhetorical" document (and I guarantee King George did not look at it as mere rhetoric!) to whom do you think they were referring if not the Judeo-Christian God? Buhda? Vishnu? Obi Wan Kenobi? Ignore your nation's history if you choose Dave. It does not change the truth of that history, despite the left's repeated attempts to rewrite it to fit their agenda otherwise. I have a terrific sense of humor. Your "pun" wasn't funny. The historical revisionism is coming solely from one side: the right. For the better part of the last half century, the religious right has been attempting to re-write our founding and trying to paint the founders as religious fundamentalists who wanted a theocracy. The facts are that we have a secular government because they wanted it that way. Americans of all faiths - even ones you mock - are free to worship here as they choose. "Where the preamble declares, that coercion is a departure from the plan of the holy author of our religion, an amendment was proposed by inserting "Jesus Christ," so that it would read "A departure from the plan of Jesus Christ, the holy author of our religion;" the insertion was rejected by the great majority, in proof that they meant to comprehend, within the mantle of its protection, the Jew and the Gentile, the Christian and Mohammedan, the Hindoo and Infidel of every denomination. " - from Thomas Jefferson's autobiography. You have missed my whole point. NEVER have I said that the founders wanted a theocracy. I said they set up this nation so, as you said via Mr. Jefferson, all could worship as they chose. That being said, the overwhelming majority of the founders drew upon Judeo Christian law and values in the formation of this country. Why this offends you is a mystery. It is fact, whether you choose to accept it or not. You can choose to believe that the Japanese didn't attack Pearl Harbor on 12/7/1941 too. It doesn't change the fact that they did so, sir. Japan attacking Pearl Harbor is an empirical fact. Saying the US is founded upon Christianity is your opinion. There is a huge difference. Dave...never mind. I am going to go talk to a wall. I suspect I will have better luck, sir.